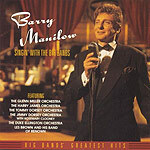 CD review: "Singin' With the Big Bands"
You have to give Barry Manilow extra credit for effort  he has more than enough money to just retire and live off the royalties from all his hits. Instead, here he is, risking the wrath of a contemptuous press with covers of some of the most beloved songs of the big band era, hits like "Don't Sit Undder the Apple Tree," "Sentimental Journey" and "On the Sunny Side of the Street." While the album claims to have Manilow paired with some of the biggest names from the big band era  the Glenn Miller Orchestra, the Harry James Orchestra, the Tommy Dorsey Orchestra, etc.  that is a bit of a stretch. Although Manilow spares us the Natalie Cole approach of laying down fresh vocals over historic recordings, these are not the real bands for the most part, but the so-called "ghost bands"  the current combos touring under the famous names (albeit with the same charts the bands used in their heydays). Truly only Les Brown and the Band of Renown (with Brown himself still at the helm) and the Duke Ellington Orchestra (with son Mercer leading) remain front-line outfits. the rest are mere shadows of their former greatness. Without the top-notch talent they once attracted, these bands just don't pack the same punch as the original versions. For his part, Manilow does a better than fair job with most of these classics. True enough, Manilow is a pop singer, not a jazz vocalist. But these songs were hits when jazz was the popular form. Manilow's lack of jazz training shows on Ellington's "Don't Get Around Much Anymore," where he seems stiff. But on the Miller band's "Chattanooga Choo-Choo," he manages to get the hang of swing in a nice reprise of Tex Beneke's original knowing vocal. Manilow will never achieve the immortality of big band legends like Frank Sinatra or Ella Fitzgerald, but on this album, backed with good material and solid direction from producer Phil Ramone, he shows himself to be the consummate entertainer, a modern equal to Steve Lawrence or Perry Como.